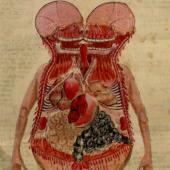 The Fabrica was by no means the first book to include pictures of dissected bodies. Indeed, they had been pictured in various works since the Middle Ages. The Stockholm roll is a reminder of just how lavish a series of illustrations could be – though it has remained a puzzle as to what the image of a longitudinally dissected body was expected to achieve. 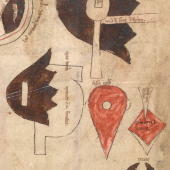 The manuscript from Gonville and Caius College shows individual organs in a schematic format, quite common among such manuscripts in the period, that sufficed for conveying information about the function of the principal organs. 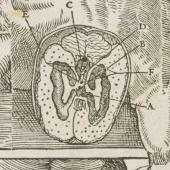 A number of printed books before 1543 also included pictures of dissected bodies with a hybrid of styles combining naturalistic and schematic representation, as in the example of the works by Ryff and Estienne. 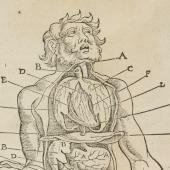 Displaying dissected bodies functioned to help tyros in medical studies, and prevent practitioners from making mistakes. 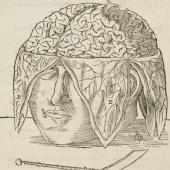 They were not meant to provide a comprehensive picture of the entire body based on first-hand dissection, which is what Vesalius aspired to.